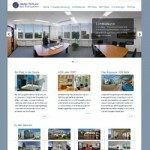 A small selection of our 360° panoramas for hotels & resorts. Many more hotel 360° panoramas and some of our best hotel photography can be seen at our web site that features our work in the real estate sector, immo-foto.eu. (Since hotels can technically be seen as very short-term rentals, we add a couple of hotel galleries to our real estate portfolio.) As most of our work in real estate has been done in the German-speaking market, immo-foto.eu is only available in German at the present. Please click on the picture to visit the home page.